As part of the rate engine overhaul, several old features have been expanded to offer more flexibility. One of those expanded features is the 'Days of the Week' selection. If you view one of your charge types (that isn't a single night), you'll see three new options per day of the week. Previously, each day was simply enabled or disabled which meant you could include that day into the current charge type as allowed or not allowed, but that left a lot of gray area. What if you wanted to require that all the selected days were booked in order for that charge type to be valid? Or what if you wanted to require some, but then not allow a specific day? Now you can do all of that. When you select a different charge type from the dropdown box, you'll notice that the Days of the Week are preselected. We've set the most likely options for you, but you're free to change them. Again, you are free to change the preselections to anything you want. On each rate period overview page, the table of charge types shows a legend for the Days of the Week. This gives you a quick visual indicator for which days are allowed, not allowed or required. As you play with these options, remember that all 'required' days are cumulative. 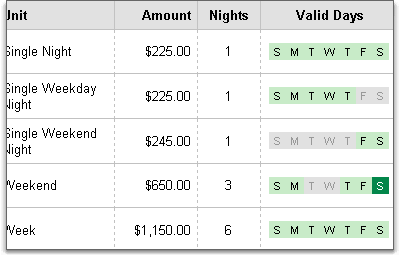 If you set multiple required days for a single charge type, the guest's desired dates must include all of those days. We tweaked this feature quite a few times to make it as intuitive as possible. If it doesn't make sense or you have a gray area that this doesn't cover, let us know.